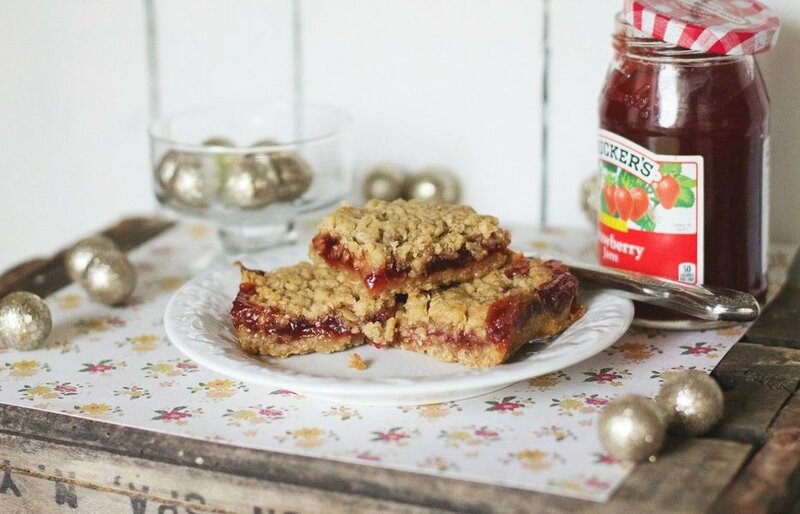 The comfort of strawberry jam and buttery oats is something truly amazing. I fell in love with this simple recipe from the man, the myth, and the legend – Pioneer Women, Ree Drummond. Okay, she’s not a man, but you see where I was going – she is a legend in my eyes though. She puts love and time into preparing her dishes, and I find myself to be the same way. Just like Ree said, “It’s a requirement to drink with a glass of ice-cold milk.” Trust me y’all it’s heaven… I sometimes get a little southern from time to time. Here’s a link to her original recipe, she shows more step-by-step directions for those who are baking challenged. Begin to preheat oven to 350 degrees, then grease a 9X13 pan. Mix all the dry ingredients (Flour, oats, brown sugar, baking powder, salt). Cut the butter with a pastry cutter or a fork, both work just the same. Do this until it resembles coarse crumbs. After, sprinkle half of the oat mixture into prepared pan. Pat lightly then begin to spread jam so it covers all of the oat mixture, then sprinkle the other half of the oats over the top and pat lightly once more. Lastly, bake for 30-40 minutes or until lightly brown. Let cool then cut into bars. ENJOY!